When I was young, I never really understood why the bread and wine were put on a little table in the back of my home parish church before Mass started. Couldn’t the priest just keep the cruets and the bowl on the side of the altar until the liturgy of the Eucharist? Why did they need to be marched back from the sacristy by an usher, and then marched up the aisle to the priest, and then doled out to altar servers before finally being used? My efficient sensibilities didn’t approve of all of this changing of hands. Get the gifts up there so that I can receive Jesus. I began accompanying Masses at my home parish when I was finishing eighth grade. At first, I looked at this opportunity primarily as an opportunity to spend a lot of my time during the Mass doing something that I love to do, which meant less time wondering what I should be thinking about or praying about or how I should be holding my hands or anything like that. I loved playing piano, and when I got the invitation to join the music group I thought playing for Mass would make me enjoy Mass more. After accompanying a few Masses the whole way through, I came to an important realization: providing music for Mass was a time-intensive job. I was still working on becoming a better pianist, and so every week I would spend hours practicing the handful of songs that were up for that Sunday, then take a quick breath and start in on next Sunday’s songs. Mass used to be either engaging or boring to me, but now Mass could be a lot of things all at once: thrilling, stressful, embarrassing, frightening, moving, exciting. In the larger cost-benefit analysis, why did anyone choose to give so much when they didn’t feel like they were getting entirely positive benefits? Why serve? 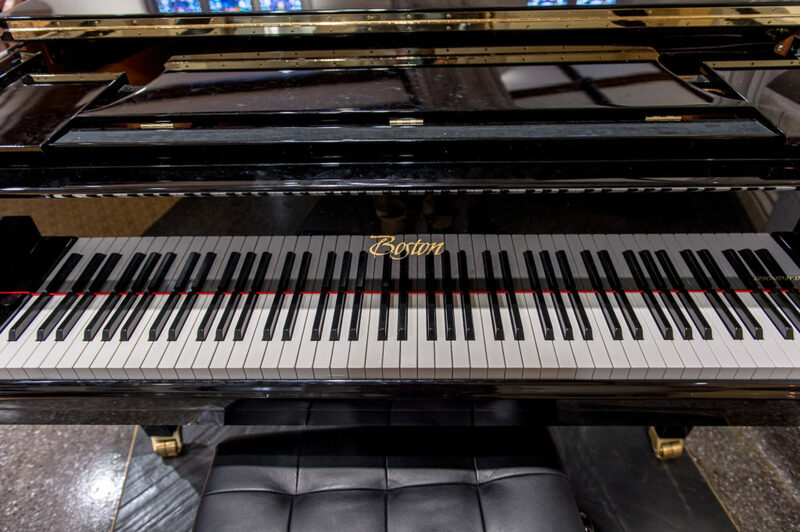 The piano in Dillon Hall chapel where Joe regularly provides music for Mass. I was stunned. People had told me that I had been doing a good job, and of course, my parents were incredibly supportive of me in my accompaniment endeavors, but this was different. This was the first time someone who I didn’t really know in any way other than by her faithful devotion of attending the Saturday 5 pm Mass came to me and told me that I had helped her to connect to Christ. That was what service to the Church was all about. I don’t give of my gifts for my own sake, I give of them for other people to enjoy too, in the hopes that they’ll bring others closer to Christ. Over time, I found that this realization powered my faith life: I started to grow closer to God through my ministry because I knew that I could take joy in this opportunity to bring others closer to God too. It took me a while, but I finally figured out why the presentation of the gifts is so important at Mass: it’s an outward embodiment of our community giving what we have to give so that our entire community may be nourished. My piano playing at Mass, then, is an extension of this presentation of gifts. The lectors, the Extraordinary Ministers of Holy Communion, and the singers are all an extension of this wider presentation of gifts, each one of them giving what they have so that our community may be spiritually nourished. Participating in the Mass is about so much more than me getting spiritual enrichment for myself. It’s about giving my gifts to God and to my community, trusting that God will use them to bring others closer to Him. I love liturgy because of the beautiful ways in which God takes the gifts we offer him and multiplies them out further than we can ever imagine. My faith life looks fundamentally different now than it would have had I never been invited to give of my gift of music to my parish community. I am privileged to be at a university where I can frequently share my gifts with so much of the campus community through accompaniment that I can pour my heart and soul into, raising myself and everyone else in song. I would encourage every person who reads this blog post to ask how they can give of their gifts to their parish community. Once you find a way that you can get involved, go and ask exactly how you can share this gift, whether it be in the context of parish life at large or in the liturgy of the Mass. For me, that primarily looks like providing music for a Mass. For others, that could mean greeting people as they come through the doors, offering to do one of the readings, or sitting next to a community member whom you can tell is having a tough day. Ministry comes in many forms, and we are each called to be ministers to one another. Our God is generous, no one is empty-handed when it comes to the gifts He gives, and we are all invited to bring our gifts to the Lord and trust that He will use them for the enrichment of our community. Why do I minister? Because I love leading the song of the Church. More than any other time, it is while leading congregational song that I find a profound sense of joy and purpose, and, thanks be to God, it is there that I am also able to encounter the world’s deep need. 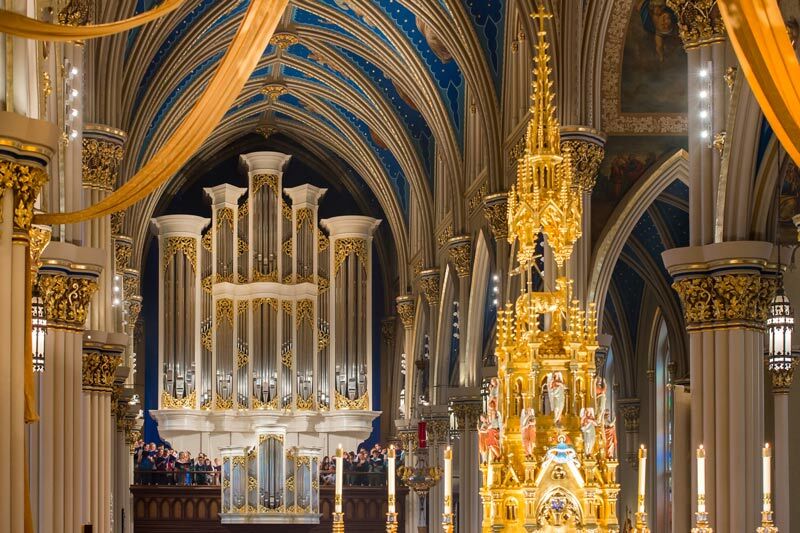 People often ask me about my job, and at Notre Dame especially whether I love playing the Basilica organs. Those questions give me an opportunity to consider what exactly it is about my vocation that keeps me going. Do I love playing the organ? Yes. The organs here on campus are magnificent. Do I love directing choirs? Absolutely yes, and Notre Dame has some of the best collegiate choirs in the country. But what I love most is leading the song of the congregation. Congregational singing is at the core of my identity as a pastoral musician because I believe congregational singing does some things that other types of music making cannot. First, congregational singing brings the whole assembly into sense of empathy with one another. Of course, one could think about that empathy theologically. To paraphrase the General Instruction to the Roman Missal, singing together in worship fosters our unity as the gathered People of God and tunes our thoughts into the joyful mysteries of the liturgy. But one can also think about that empathy scientifically; indeed researchers are discovering that singing together not only builds stronger social/psychological bonds, but that singing together for an extended period of time actually causes people’s breathing and heartbeats to synchronize. Singing together creates literal, physiological empathy. When I’m at my best leading song from the organ, I also get to experience that empathy. It’s a mystery to me how it is, in a Basilica filled with a thousand people, that I can feel them all breathing together between phrases of a hymn, but I often do so from my perch in the organ loft. Similarly, whenever one of the stanzas of a hymn has a particularly rousing text, I can feel the congregation instinctively making a praise-filled crescendo, which I can then seek to match with a crescendo from the organ. The experience can be intense, and often I can sense the presence of the Holy Spirit in those times, moving us all to a more profound expression of praise. 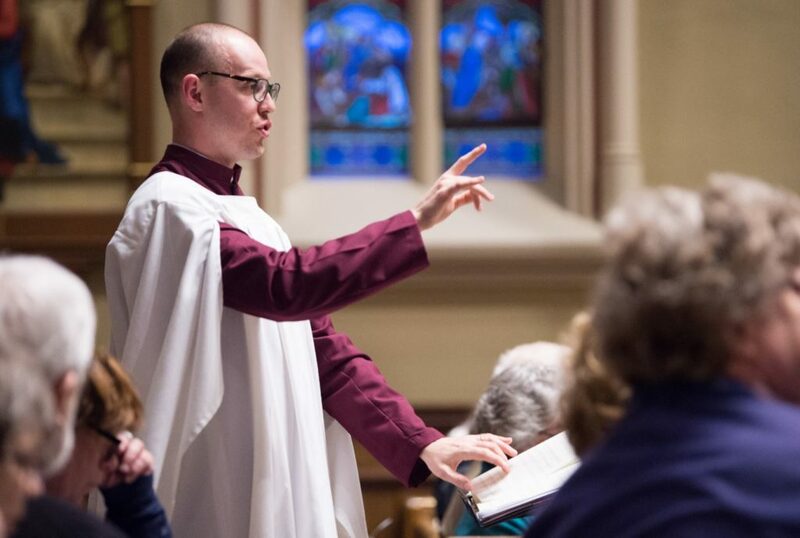 Jonathan leads the opening hymn from the 2018 Lenten Choir Concert at the University of Notre Dame’s Basilica of the Sacred Heart, March 3, 2018. People sometimes remark to me that the Roman Rite has too little room for creativity, or that it’s too narrowly Western/Italian/Roman in its structure and aesthetic. Depending on the day, I might agree with them. But in reality, there is a tremendous potential for flexibility in the Roman Rite, and, fortunately for us musicians, most of that potential lies in the realm of music. What I love about the flexibility of music in the liturgy is how it can help us celebrate the diversity of creation and offer hospitality to the “others” in our midst. That’s the second thing I think congregational singing can do in a way that other musics cannot. When I was a kid, the congregation I was part of, though it was almost completely homogenous, made an intentional effort to sing music from a wide variety of Christian cultures around the world. At the time, I just thought that it was fun to sing songs from Brazil, or Tanzania, or Singapore. But what I realize now is that those songs were teaching me about the diversity of God’s people. I was learning that there were people different from me who shared my faith, and who were no less created in the image of God than I. As a leader of song, I want to pass on to others that same idea: the more we reflect the diversity of creation in our music, the more we reflect the image and glory of God. In a place like Notre Dame, we have an obligation to both uphold our musical tradition and to reflect the diversity of the university’s increasingly global community. That’s part of why I minister, because I love using congregational song to help my community sing its solidarity with other Christian cultures, cultures which can teach us much about how to live the Christian life, and which help us broaden our image of God. A wise colleague of mine once reminded me that, for our increasingly diverse congregations, including different genres and cultural musics in worship is also a matter of hospitality. Choosing to sing music only from the majority culture in our churches is missing the opportunity to show the “other” among us that they are valued. It’s also a way in which we can enable visitors to the liturgy who are not familiar with our language or songs to participate with us in prayer. As a leader of congregational song, if I can help enable the congregation’s celebration of diversity and its sense of hospitality, then I will. Lastly, congregational song can enable us to sing through the full range of our experience as people, and can help us have difficult theological conversations. Singing the praise of God is a good and noble venture, of course, but praise is not the only function of congregational song. Hymns and psalms are also there to give us voice when we mourn, or when we are angry at God, or when we feel confused and frustrated by what is going on in the world around us. They are a means of having a theological conversation. When I choose music for the liturgy, I constantly look for opportunities to bring people into those theological conversations. When our hearts are overflowing with emotion, with grief, with anger, with frustration, we often find ourselves at a loss for words. Songs can be a means of helping us process those emotions, and open us to the presence of the Holy Spirit, who is with us in the act of singing and who intercedes for us with sighs too deep for words alone. Some little ones have seen their siblings die. A stream of life beneath the desert sky. Their welcome here? Detention, overflowing. O Lord of love, now hear your children’s cry! They’ve traveled here with nothing in their hands. Leads to a phone, a brother here, a plan. They bring a plea that we will understand. You blessed the children, telling them to stay. Be at the border where they are afraid. And may your gift of mercy start with me. And in each child, it is your face we see. (1) From the hymn “When In Our Music God is Glorified” by Fred Pratt Green, 1972. (2) From the collection When Grief is Raw: Songs for Times of Sorrow and Bereavement by John L. Bell and Graham Maule. (3) http://www.carolynshymns.com/the_children_come.html. Used by permission. This hymn is also available in the collection Singing Welcome published by the Hymn Society in the United States and Canada. So often we’re in the routine of doing things that we forget to stop and take stock of why it is we’re doing what we’re doing. We get so caught up in our busyness and keep charging ahead with everyday routines. That’s why I’ve particularly enjoyed this “assignment” of offering a reflection on why I minister at Notre Dame as an organist and choir director. I’ve come up with a “top ten” list to share, but this is in no way comprehensive. Reason Ten: Gotta love the diversity of skills required for someone working in music ministry! Not only do I direct choirs, play the organ, and occasionally compose music, but I also work with teams of students and colleagues. Other requirements are people skills and inviting students to join in our ministry, along with planning upcoming events. There is never a dull day in the office. Reason Nine: The words we sing in Church remind us of our values and beliefs, and help keep us on the right and true path where we need to be, oriented towards God. This is why a church musician’s job of selecting texts that we put on the lips of the faithful is so crucial and important. We are more apt to stand up for justice if we are regularly reminded of our values. I see a very high percentage of our choir members going into service-related careers after graduation, and that’s something to be celebrated, living in a world that often seems to lack a moral foundation. Reason Eight: Saint Augustine had it right when he said, “To Sing is to Pray Twice!” Music has a powerful way to ingrain texts within us and deepen our understanding of them, particularly when they’ve been set to music by inspired composers. Fostering the prayer of any gathered assembly has always been a top priority. Music can easily become a distraction, and the intent is always to keep the focus on the texts being sung, and put these texts on the lips of the assembly. Reason Seven: We can instantly unite people coming from different cultural backgrounds by doing music of diverse music styles and time periods, languages, and through incorporating a diversity of musical instruments. As part of the universal Church, we want to ensure that truly “all are welcome.” We have a broad palette of music to choose from that can unite us. We’ve seen in recent years how much our country is torn by disunity, so it’s time we all took a stand for unity through whatever means we are able! 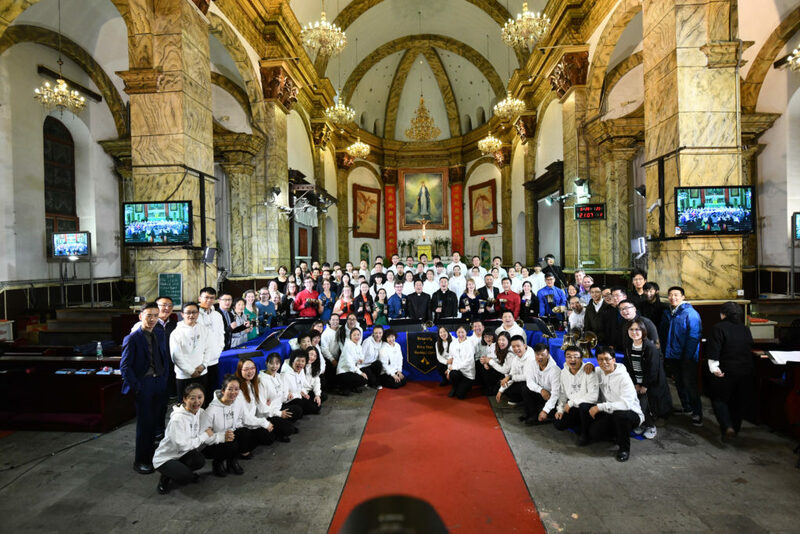 Notre Dame Handbell Choir pictured in South Cathedral, China, with parish musicians. Reason Six: Serving as a musician at our Basilica of the Sacred Heart has always been a joy and privilege, that never gets old. The Basilica is truly the heart of our campus, where our community of N.D. and the community of the wider Church gathers to celebrate mass, highlighted feasts of the liturgical year, births, marriages, where we mourn our dead, administer the sacraments of initiation, and ordain men to the priesthood, representing the future of our Church. What a privilege and grace to experience so many powerful moments that really matter, throughout the entire year! Reason Five: Unity. 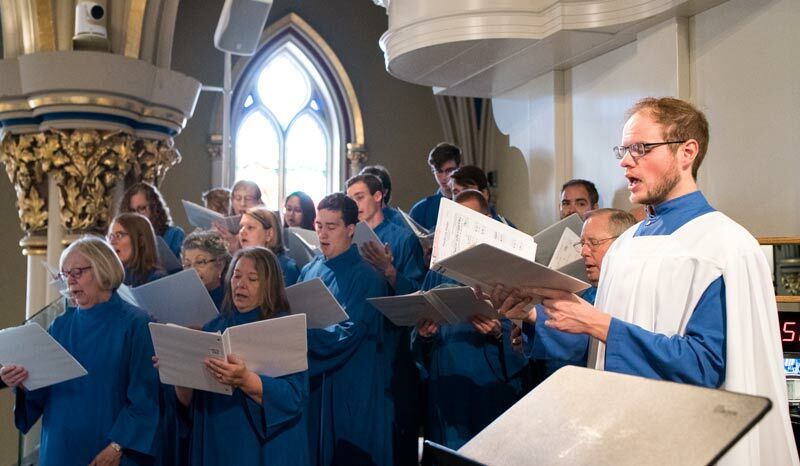 Liturgical music, whether singing/participating in it, powerfully connects people to one another, whether its with a group of people who know each other as in a choir that meets regularly, or a disparate group of people who will only all be together a single time, coming from many different places and walks of life. Music is a God-given instrument that connects us not only to each other, but us to God. It seems that people have grown more isolated with the rise of technology that was oddly designed to connect us, so we need music more than ever to bring us together. Did you know that scientific studies show that when a group of people sing together, their heartbeats often align? Singing is also found to decrease stress, depression, and anxiety, and gives us a sense we are part of something much bigger than ourselves, which is the Universal Church! Reason Four: Music does save lives! This may seem like an overstatement, but I’ve witnessed this countless times. For those battling addictions, depression, loneliness or anxieties, not only does the act of singing elevate our spirits, but choir members are held accountable to the larger group, where it’s important to show up on a regular basis, and members are instantly part of a loving, nurturing group that wants to see each and every member succeed. Singing in a choir or making music with another group of people is one of the best ways to stay healthy and be emotionally supported when we are living in very challenging times. Reason Three: It’s all about the PEOPLE. When I reflect back on my twenty years in music ministry here at N.D., it’s the names and faces of those I’ve worked with that matter the most. So many students who were involved in sacred music here have continued lives of service after they leave this place, whether they are doing this full-time or part-time. Numerous couples have met/married through participating in our choirs. A good number of men have entered the priesthood. Through our choir pilgrimage tours domestic and around the world, we almost exclusively stay with families from the parishes we are visiting, who give us unique insights about their own Christian communities. What a gift! Reason One: FAMILY. Family is created through our choirs and working closely with colleagues. The great thing about N.D. is that people keep coming back to this place, not only for football, but for things that really matter, like weddings, baptisms, for the Triduum, and times of loss, to be grounded anew in what drew them to this place initially: our faith in Jesus Christ. We are rooted in our Catholic faith, sent forth with hope, love and joy to bring to the world! As the stubborn 16 year old I was, these words probably were not a surprise to my Mom. She calmly explained, in between my dramatic sobs, that the retreat was already paid for, I was specifically recruited to attend, and that it was at Notre Dame. Oh, and that the plane was leaving in a matter of hours. There wasn’t much of an option. It was a typical Southern California morning in June – slightly foggy with the sun poking through the clouds, indicating that the fog had every intention of burning off. In the (silent and slightly awkward) car ride on the way to the airport, I thought deeply about this “Notre Dame Vision” thing. I had been on so many retreats it was impossible to count at that point, and to be completely honest, I was burnt out. I was tired of feeling like my emotions were always out in the open, tired of the general structure of a retreat, and was tired of the whole “Catholic” thing after spending 14 years in Catholic school. I was exhausted, and my struggles with the Catholic faith at the time weren’t exactly spearheading any sort of excitement for yet another retreat. I also had visited Notre Dame around 4 years prior for a football game and loved it. I didn’t want to taint that experience with something I was convinced would be horrible. I composed myself as best as I could before saying goodbye to my Mom, gathered with my classmates at the airport, and began the weeklong journey that would so profoundly affect my life that I often have trouble explaining its magnitude. Arriving at Notre Dame on the bus, with a friend-recommended Fleet Foxes album blaring in my ears, was the first moment I realized that my outburst that morning was completely unnecessary. Notre Dame’s beauty was absolutely beyond anything I remembered from that rainy football weekend in 2008, and almost instantly my mood shifted from begrudgingly accepting my fate to overwhelming excitement and wonder. 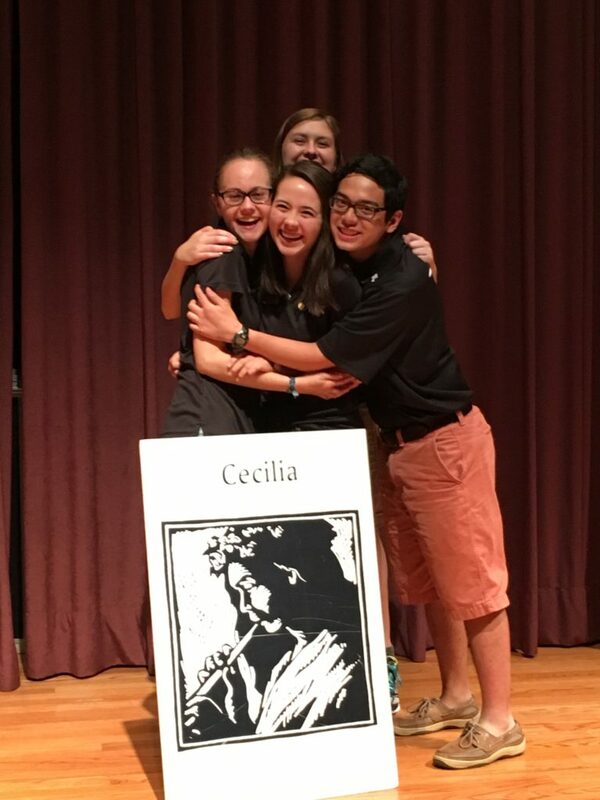 This moment was also profound in my understanding and love of music that I carry with me today – it was the first moment that my 16-year-old mind began to tangibly associate music with such a deeply contemplative feeling. That humid week in July was extraordinarily impactful on my faith and emotional development. I grew close with my mentors, exchanged many memories with my small group (some of whom I’m still in contact with today), and discovered a deep connection to my faith through music. All I wanted after that week was to be in the Notre Dame Vision band. All I wanted was to be able to stand up there on the DeBart 101 stage, guitar in hand, and allow thousands of people to feel what I felt – that connection between faith and music. I wanted to be able to spread my newfound, explosive love of music with everyone. Fast-forward a few years, two summers into my already unbelievable experience as a Notre Dame undergrad, when this dream came true. In the summer of 2016, I served as the guitarist for the Notre Dame Vision band – an experience that, again, is hard to explain in words. I had the opportunity to craft and read a Witness Talk about a deeply personal part of myself, an experience that allowed me to continue my healing in a community of unconditional love. I acted on stage, bringing me back to my love of theatre that blossomed in high school. And I became friends with 62 truly remarkable people, my fellow mentors, whose expressions of love and support have continued to affect me today. Looking back on the day of my flight to Notre Dame makes me feel a little strange. Had I not boarded that plane, I would likely not be a student at Notre Dame. 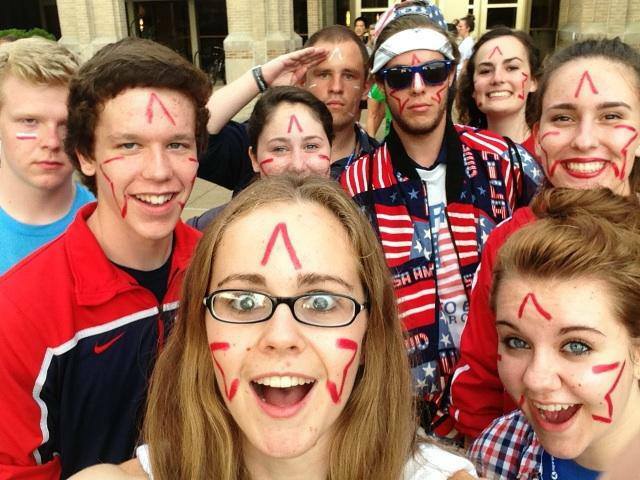 I would not have my Campus Ministry job, and would not have met the friends that have already positively affected my life. I would not have been a Music Mentor at Notre Dame Vision in the summer of 2016. And here’s the kicker: I would absolutely not be Music Director of Notre Dame Vision for this coming summer. When I think of the chain of events that led me to Notre Dame Vision, the opportunities I have had, and my present-day closeness with the program, I picture God smirking up in heaven and saying, “I told you so!” He knew all along – He knew I would put up a fight getting on the plane that summer morning in 2013. He knew all it would take is one look at the Notre Dame campus with one certain album playing through my earbuds to get me completely hooked. He knew I would go on to prove my angsty, 16-year-old self wrong by serving as a Mentor and later having the opportunity to serve as Head Staff. He knew that I needed a struggle in order to fully appreciate the impact this program would have on me. My trust in God’s plan for me and His place in my life has continued to grow while at Notre Dame, both through my Notre Dame Vision experiences and just from the blessing of being a student here. So, no, I hadn’t been on enough retreats, as I originally thought. 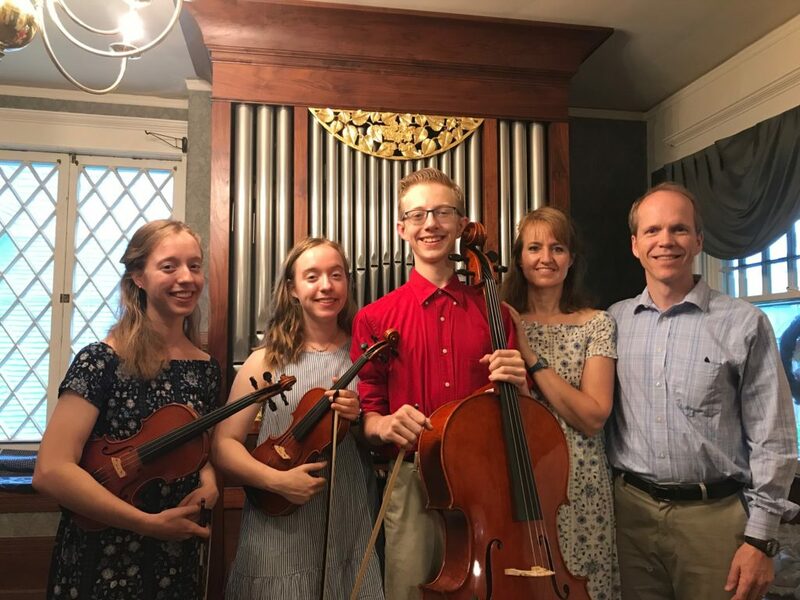 I needed Notre Dame Vision, more than any other, to open my eyes to God’s plan working in my life through something I already had a personal connection to – music. And as I look back on these past four years as a Notre Dame undergrad, I truly realize how much He has been present, guiding me every step of the way to seek out those opportunities that would lead me to Him. I still put on that Fleet Foxes album when I’m feeling nostalgic about that unbearably hot week in July of 2013. I played it the Monday morning of the first week of Vision in Summer 2016, just hours before I finally got to fully realize my guitarist dream coming true. I played it the day I accepted the Music Director job for Summer 2018. And I know I will play that album the day I graduate from the University that has given me more than I ever imagined. God speaks to his people in many different and varied ways. For some it may be through the comfort of the Mass, or for others, the silence found when we’re open to it. For me, I’ve always felt God’s presence most in beauty. Whether it’s in his creation, the words of a prayer, or in the kindness that people show to one another. However, the beauty that has taken the deepest roots in my life has been the gift of music. I vividly remember first finding this beauty in Beethoven’s symphonies when they were originally introduced to me in my second grade music class. From then on I would, as most grade-schoolers do, save up my pennies to buy cassette-tapes of Mozart and Bach (Oh, wait—was that just me?!) I felt a strong pull to immerse myself in this beauty. At the same time, I remember falling in love with the beauty of the Church as I experienced it in my community. It wasn’t until high school, though, that these two areas of my life began to intersect. Through the encouraging guidance and example of a high school mentor, I began to see the peace found in a life devoted to serving God and his people through music. Through my mentor, I was introduced to the pipe organ, the human voice, various monastic traditions, and the vulnerability that necessarily accompanies creativity. This, along with his inspiring love for his family and vocation, became a powerful model of a music minister’s life. It is a life which strives towards holiness through prayer and creativity. As in most areas of my life, my sense of vocation did not come to me quickly. While I had a passion for music and the Church, it wasn’t always clear that these things should work together in my life. I don’t think I can pinpoint any one moment when I realized my vocation was to be a music minister. Rather, it has been through small moments, encouragement, challenge, and loving examples, that this picture has slowly come into focus. I feel compelled to bring others to the beauty that I find around me. All of us are created in God’s image and should strive to reflect this beauty in ourselves and in all that we do. I take comfort in the fact that we’re all struggling together as we strive for holiness, just as many saints have done before us. When I first arrived at Notre Dame for an interview over two years ago, the beauty of this campus was immediately apparent. Despite the gray and cold outside on that particularly frigid February day, I found warmth in all the people I encountered and in all the sights I saw. As I had felt at similar moments of my life, I was drawn to this beauty and curious to explore it further. Having now spent two years as a campus minister at Notre Dame, I’ve been blessed with many moments of beauty. I’ve experienced it in the musical offerings of our choirs, in the familial care our students have for one another, in the intricate details carefully painted in the Basilica, and in the calm of a walk around the lakes. Most powerfully, I’ve seen it in the examples of service for the body of Christ that many of our choristers are boldly living out through their daily lives. All of this has enlivened my own zeal for ministry here on campus. I minister because I hope to leave this world more beautiful than it was when I first found it. Jesus, through the greatest act of beauty, gave his life for us that we might fully experience his love and mercy. In the same way that my mentors, choristers, and students have inspired me to delve more deeply into this love, I pray that my work in campus ministry might do likewise for those around me. One of the most loving things we can do is to help others find this in the person of Jesus Christ. Particularly in the spring, this simple quote from the Greek playwright Nikos Kazantzakis often pops into my mind: “I said to the almond tree, ‘speak to me of God,’ and the almond tree blossomed.” If we use our creativity for the pursuit of beauty, we’ll surely find God.